If you are a landowner with beech, oak or hazel woodland growing on chalk or limestone, you may have native truffles growing and we can work with you to gain an income from your woods. We have worked with clients across many parts of southern England surveying their woods for truffles. For some, we return regularly to harvest truffles making a valuable contribution to their farm or estate income. Truffle hunting - fee-basis. You can "hire a truffle hound" to search your woods for truffles. Any truffles that are found are yours to do with as you like. We can sell them on your behalf. You and your family or friends are welcome to accompany us as we search. Truffle hunting experience days. We are looking for additional sites in southern England to allow us cope with the demand for these popular days. We pay landowners for access to their woodlands and any truffles found. Some farms or estates also supplement their income by providing an indoor venue, lunches and refreshments. Please contact us if you think you have suitable woodland including your postcode and woodland size. For a small fee, we can also undertake a "desktop survey" of your woodlands, looking at a range of information sources to assess your woodlands for the likelihood of wild growing truffles being present. This may be a sensible first stage before hiring a truffle hound. Please contact us for more details. 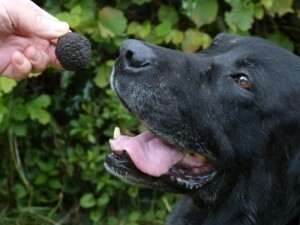 You can hire a truffle hound and handler by the day or hour to harvest your truffle crop. We have been finding truffles for seven years so have considerable experience. Please contact us with your postcode and plantation size to request a quotation. We are looking to extend the network of our “rent a truffle hound” service. If you have a trained truffle dog and would like to search woodlands or truffle orchards on our behalf, please contact us.